Tuesday was Crane Day in Monterey. We shut down the 6000 block of Main Street for a few hours in the morning as we lifted the roof panels into place for the First National Bank of Monterey(FNBM) Annex project. The panels are 2′ wide by 40′ +/- in length making them somewhat unwieldy to handle, but minimizing the number of splices required. Fewer splices will mean less maintenance over the life of the roof. 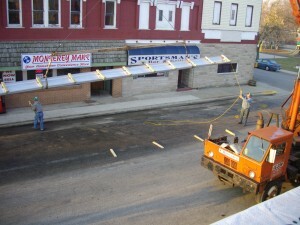 The crane was set up in front of the bank and we closed the street for several hundred feet in both directions. Forklifts were used to maneuver the panels around to where the crane could pick them up. The lengths made the use of a spreader bar and tag lines necessary. We reviewed safety issues with our crew and our Safety Officer, Will Pearson, went down to make sure things were done correctly. We took extra effort to contact all the affected businesses so they were aware of the situation. The Town of Monterey took advantage of the situation and cleaned the street while we had it shut down. It ended up only taking about three hours in the morning so we were done and the streets were open before the noon “rush hour”. It was St. Patrick’s Day after all! We are installing an BMC MR-24 Roof on this building. FNBM already has this roof on the last addition and has appreciated its weathertightness and low maintenance. The conditions we have on this building allow us to install the panels with limited splices and only two roof penetrations. This should be an exceptionally tight roof as well. MR-24 qualifies as an economical and environmentally sound solution due to the use of recyclable material and its design allowing minimal heat transfer. We installed two layers of insulation for a total rating of R-38 in the roof. 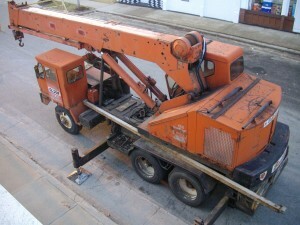 We are also installing MR-24 over an existing area of flat roof on the existing bank building. this should solve some leak problems they have experienced as well as providing some additional insulation. The MR-24 has a somewhat reflective finish which will help reduce heat gain in the summer. Update 4-2-09: Jeff Kenney at the Culver Citizen picked up this post and reprinted it. Hey, we’re almost famous!